World Capoeira Federation (WCF) is an international nonprofit organization with the objective of promoting Capoeira as a world sport. WCF recognizes capoeira as a cultural heritage of Brazil and respects its historical roots and philosophy. Today WCF is the only international capoeira institute on sport Capoeira which standardizes sport norms for Capoeira, organizes worldwide capoeira competitions, capoeira coaching qualifications and International capoeira referee courses. WCF covers the whole world of Capoeira. 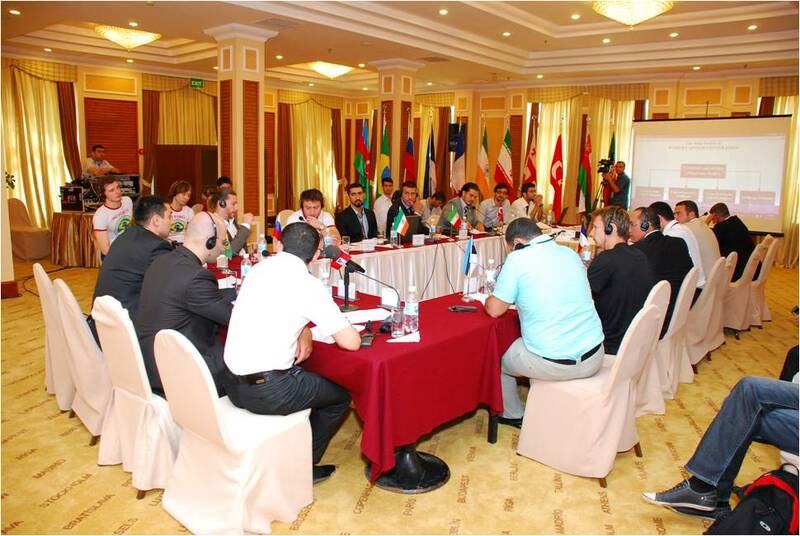 The first idea of creating the World Capoeira Federation was proposed at the 3rd World Forum on Capoeira, which was held in Baku, Azerbaijan, June 18, 2011. The author of the project is Jamil Huseyn. The aim of the project was to bring together of various capoeira organizations that were scattered around the world under a single and strong international Capoeira federation. Since establishment WCF began to organize world capoeira competitions in which all international capoeira groups and associations could participate. Capoeira sport norms and standards were applied first time in these events. As a result of the successful work done, the number of members of the federation increased with each passing month. Members of the World Capoeira Federation are national capoeira federations established from international capoeira groups such as "Capoeira Brasil", "Muzenza", "AXE Capoeira", "Capoeira Gerais", "Candeias" etc. - to defend the interests and rights of sportsmen, trainers, capoeira masters and other capoeira specialists. General Conference is a Supreme Body of WCF. General Conference consists of Full members of WCF. 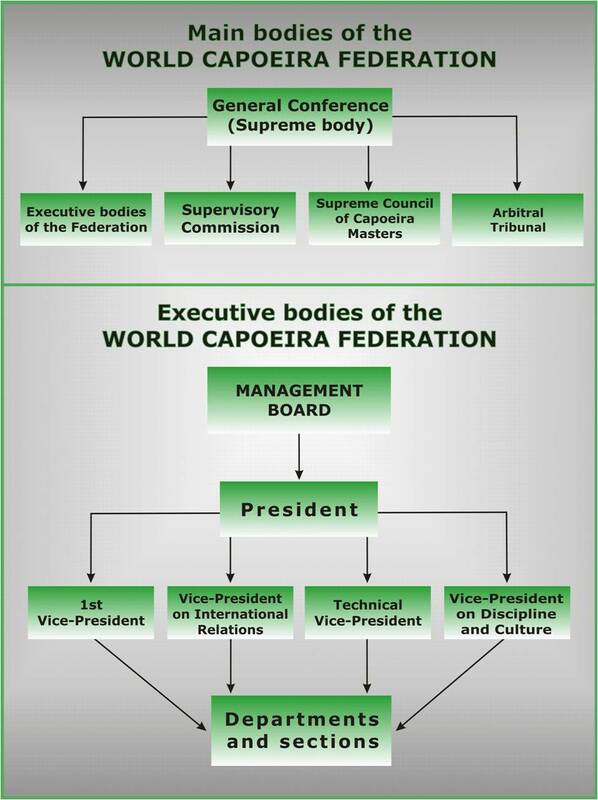 Full members of WCF are National and Continental Capoeira Federations (Associations). General Conference is held at least once a year. General Conference may adopt any decision related to the WCF’s activity that is not contradicting with demands of the statutes of WCF. Each Full member of WCF has only one vote in General Conference. Management Board is a head of executive body of WCF and is one of the principal bodies leading current activity of WCF during General inter-Conference period. The chairman of the Management Board is considered as the President of the WCF. Management Board consists of 12 members. Members of Management Board are individuals. Decisions of Management Board are made with the ordinary majority of votes in an open voting manner. Supervisory commission is one of the principal bodies of WCF which realizes control and inspection activity in WCF, and consists of 5 members and a chairman. The members of the Supervisory Commission are individuals. The Supervisory commission reviews written applications submitted by the bodies and members of WCF within a month, and responds accordingly. Council of Masters is one of the principal bodies of WCF which recognizes capoeira masters in the world, records them, as well as prepares the technical procedural rules of capoeira. A Master registered by the Council is considered a member of this body. The number of members of the Council is not limited. Arbitral Tribunal is one of the principal bodies of WCF which solves disputable issues between the members of WCF, and its decision is binding on all members. Each WCF member may file a claim with the Arbitration Court in connection with a controversial issue.